ASK1 antibody LS-C18846 is an unconjugated rabbit polyclonal antibody to human ASK1 (MAP3K5). Validated for ELISA and WB. Cited in 1 publication. KLH conjugated peptide corresponding to amino acids 76-87 of human ASK-1 protein. This phospho specific polyclonal antibody reacts human pS83 ASK1 and shows minimal reactivity by western blot, ELISA and competitive ELISA with non-phosphorylated ASK1. Although not tested, this antibody is likely functional in RIA, immunohistochemistry and immunoprecipitation. A 155 kD band corresponding to human ASK-1 is detected. Whole cell lysates from SW1353 can be used as a positive control. Store vial at -20°C prior to opening. Centrifuge product if not completely clear after standing at room temperature. Dilute only prior to immediate use. For extended storage aliquot contents and freeze at -20°C or below. Anti-ASK-1 phospho specific pS83 Antibody - Western Blot. Western blot of anti-pS83 ASK1 antibodies shows specificity for phosphorylated human ASK1. 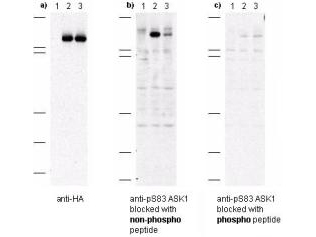 Anti-pS83 (aa 76-87) antibody was tested by western blot against Cos-7 cell lysates after transient transfection with 1) vector only, 2) recombinant HA-ASK1, and 3) recombinant human HA-ASK1 where S83 was substituted with an alanine residue. Cells were lysed 24 h post-transfection in 200 ul of 1x SDS-sample buffer, heated at 96?C for 5, and vortexed for 30 sec. Samples (10 ul each) were separated on a 12% SDS-PAGE gel and transferred to PVDF (Millipore) followed by blocking for 45 using TTBS supplemented with 5% non-fat dry milk. All incubations were performed at room temperature. In panel a) all samples were incubated with anti-HA antibody. This blot demonstrates both recombinant transfections express rASK1. In panel b) all samples were incubated with anti-pS83 ASK1. Lane 2 shows strong specific staining of ASK1. Lane 3, where S83 was replaced with alanine, shows greatly diminished staining. In panel c) all samples were incubated with anti-pS83 ASK1 antibody as before except the antibody was pre-incubated with phospho peptide prior to membrane incubation. No staining is observed after phospho peptide blocking occurs. 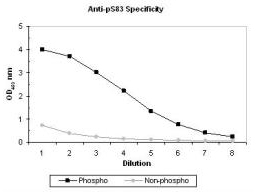 Anti-ASK-1 phospho specific pS83 Antibody - ELISA. ELISA results of purified polyclonal anti-pS83 ASK-1 (aa 76-87) antibody tested against BSA conjugates of non-phospho and phospho forms of immunizing peptide. Each well was coated with 0.1 mg of conjugate. The starting dilution of antibody was 1:1000 and each point on the X-axis represents a 2-fold dilution. HRP conjugated Gt-a-Rabbit IgG H&L and TMB substrate were used for detection.